My family has a favorite Chicken Macaroni Salad Recipe that we have been having at family functions for as long as I can remember. It is one of our friends most requested recipes when we are having potlucks, baby or wedding showers, or summer picnics. When I met my husband and we had our first joint family get together, my mother in law informed me my husband wouldn’t eat it. He even said he has never liked a macaroni or tuna salad that he was served. I begged him to try mine and he fell in love. Now when there are leftovers no one gets a chance at them if he knows they are in the fridge. The thing is we didn’t always make it with chicken, we used tuna, but all that changed when my sister was diagnosed with a fish allergy. With a few simple swaps we were able to keep serving our most requested dish and no one has noticed the changes. Make this tasty Chicken Macaroni Salad Recipe at your next family function and watch the requests pile in. Cook Elbow Macaroni according to directions on package. Rinse with Cold Water and allow water to drain. While the elbow macaroni is draining, dice the onion into small pieces. Set aside. Add diced onions, Miracle Whip, Mustard, and chicken. Stir well making sure that you cover the macaroni at the bottom of the bowl. Start with 1 Tsp of Seasoned Salt and mix well. Add more to taste. I just served this recipe this past weekend at my daughter’s 10th birthday party and my sister has put in a request for my nephew’s first birthday. His party will have twice as many people so I will easily double the recipe. This recipe is also an easy recipe to cut in half when serving smaller crowds but like I said we never have leftovers go to waste. To create a complete meal try these other tasty recipes. 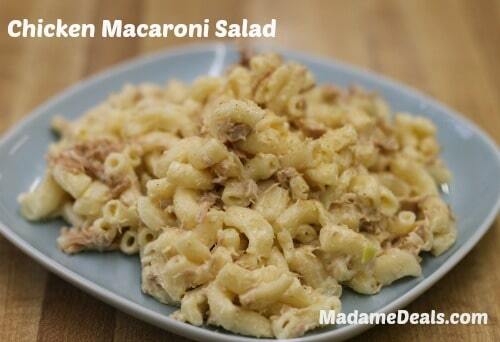 Does your family have a favorite way they serve their Chicken Macaroni Salad Recipe? Let us know how you spice it up below.